You plan things out, buy the parts at what is usually no small expense, get all your parts and tools out, and than two parts don’t fit together. Or there isn’t a hole to run wires where you expected, and drilling one isn’t a good option. So you explore other options, and work arounds, and get things to work, but at either more expense, time or project aesthetics. I hope the beer in Mexico is cold and cheap. With that off my chest, progress is being made, parts are arriving, and money is being spent. While I admire Captain Ron’s method of navigating – “Besides, if we get lost, we dock somewhere and ask directions.” I thought a GPS might come in handy. 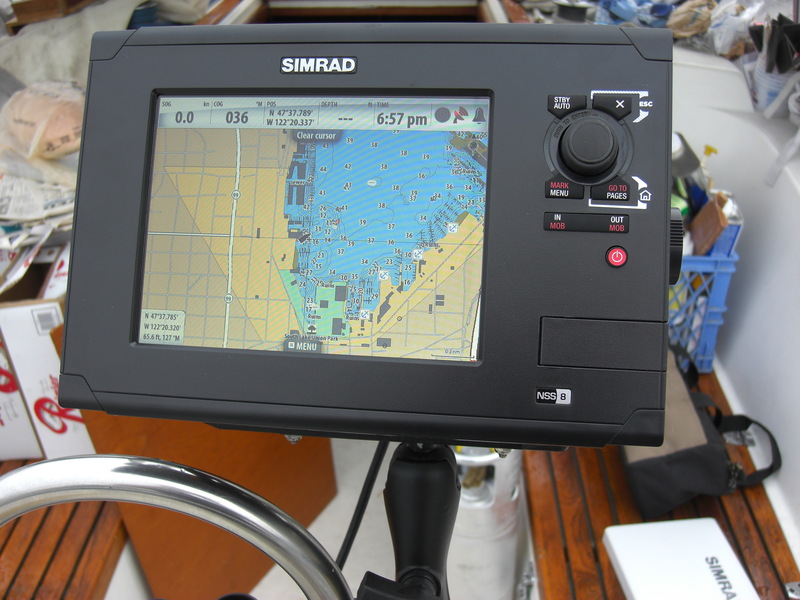 I now have a Simrad NSS8 mounted at the helm, wired to power and showing us almost in our slip in Lake Union. Of course the wiring would not run down the pedestal as ancipated, and my attempt to loosen the pedestal to fish for the wire resulted in breaking one of the four bolts that holds the pedestal down. I think I may have created more work for myself than the actual project took. And that includes the half hour spent digging through 3 tackle boxes of fastners and a trip to West Marine to get the right size bolts to hold down the mounting bracket when my collection of fastners failed to yield the right ones. But at least I know where I am now. Next step on this project is mounting the radar and connecting it to the GPS. The bracket is due in Wednesday, and I picked up a reasonable climbing harness at Second Ascent in preperation to climp the mast to install the radar dome. I’m more than a little concerned about running the wire down the mast after my epic fail to run a smaller wire down the much shorter pedestal, but such is tackling projects. There is also a transcucer to install, but that will have to be done during a haul out, and that may happen further south. Besides finishing up the electronics installations, which also include a SSB radio, VHF radio, and hopefully getting everything to communicate, the other two major items on the list are the refrigeration installation, and the arch and solar panels. Of course, there are also two pages of little projects to work on, no big deal. Jenn has been painting the inside of the icebox, and the insulated lids I built. A coat of shiny white paint makes everything look better! The compressor and plate are scheduled for delivery tomorrow, and I’m hoping to have them up and running in the next couple days. It will be amazing to have more space to keep things cold, and I can’t wait to get the electric cooler we’ve been using out of the cockpit. Although for a $50 Craigslist purchase, it has worked like a champ. Except when the wiring failed and my fix wired it backwards so it ran hot. That is a quick way to spoil a cooler full of food. 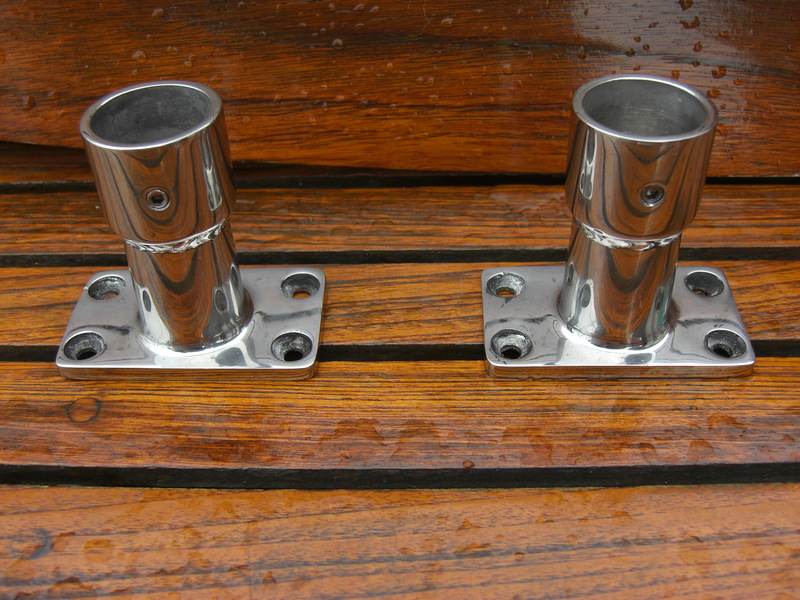 The bimini install is already a saga, and so far there are only two pieces to show for it. After a day of trying to solve a problem of attaching 1.25 tubing to a 1″ rail, using fittings from the same company that didn’t fit together like the ones on my neighbors boat who’s bimini design I copied, I decided on a manly solution. I took the parts I needed to connect to Hjorth metal fabricators in Ballard, and for a well spent $50 had them welded together. Our welder said the welding didn’t meet the $50 minimum charge, so he polished the old mounting plates I had taken in as well. Every once in awhile a solution seems to work out, and I think this one will. Not only will I not have to use some parts I was planning on using, this should be a much stronger solution that looks beautiful. Now if the pieces I have on backorder would just show up, I think I’m ready to assemble my bimini. Then comes mounting the two solar panels that seem way bigger in person than reading dimensions online suggested. What I’ve learned over the last few days is if you want time to fly by, set a deadline for something with two pages of projects to accomplish before your deadline arrives.